David Gibson & Daniel Strange (eds. ), Engaging with Barth: Contemporary Evangelical Critiques (Nottingham: Apollos, 2008). 403 pages. ISBN: 978-1-84474-245-5. Review copy courtesy of IVP Books. So reads one of the books that my two-year-old daughter is really enjoying at the moment. It’s written by Michael Rosen; it’s called We’re going on a bear hunt; and it’s really fun to read (or at least it was the first twenty or so times!). So what has this got to do with Karl Barth? Karl Barth is doubtless the most significant theologian of the twentieth century. I have no doubt that the Church will be reckoning with his thought until the parousia of her Lord. He really is twentieth-century theology’s bear whom the Church can neither go over, under … nor around. Love him or otherwise, here is one thinker ‘We’ve got to go through!’ So it is encouraging to see the appearance of Engaging with Barth: Contemporary Evangelical Critiques, a volume whose very appearance could be construed as an acknowledgement from some of conservative evangelicalism’s more seasoned scholars – and, most encouragingly, some of its newer voices – that Barth must be taken more seriously than he has been thus far. It even comes with its own website. Each essayist shares (to varying degrees) a conviction that Barth’s thought ‘provides both opportunity and challenge for evangelicalism’ (p. 18). Thus the stated aim of the book is ‘to model courteous and critical engagement with Barth in some of the places where we suggest he does not offer a satisfying way of interpreting Scripture, reading church history and confessing Christian doctrine’ (p. 19). 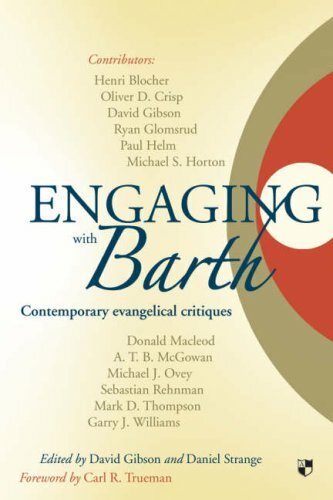 While not every reader will share every conclusion reached in each chapter, each essay certainly models the kind of ‘courteous and critical engagement’ that Barth deserves. There are, however, few surprises. Henri Blocher’s essay, ‘Karl Barth’s Christocentric Method’ concludes that while Barth’s christological concentration allows Barth to ‘arrange the whole of the divine work in a beautiful symmetrical fashion’ (p. 45) his view of Scripture ultimately leads him to depart ‘from textual meanings’ and this causes ‘a serious tension with his ‘love and respect for the Bible’ (p. 48). This is a recurring theme through the book. Sebastian Rehnman reflects on Barth’s proclivity towards paradox and dialectic, asking ‘Does it matter if Christian doctrine is contradictory?’. Ryan Glomsrud, in an essay entitled, ‘Karl Barth as Historical Theologian’, reminds us that Barth was a man of his time. Of course, part of Barth’s greatness (as with any theologian) was his ability to transcend his time at key points. Andy McGowan offers a clear and critical reading of Barth on the classical Reformed doctrine of covenant theology. Other essays include Mark Thompson’s on Barth’s doctrine of Scripture, Michael Ovey’s on Barth’s doctrine of the Trinity, Garry Williams’ on Barth on the Atonement, Paul Helm’s on the visibility of God, and Donald Macleod’s on ‘Barth as Ecclesial Theologian’. A concluding chapter by Michael Horton explores Barth’s legacy for evangelical theology. Would that more so-called ‘evangelicals’ read Scripture in order to find Christ! I mean, isn’t that the only real reason any of us should care what Paul or Moses or John thinks about anything! As Luther once said, ‘Christ is the Master; the Scriptures are only the servant. The true way to test all the Books is to see whether they work the will of Christ or not. No Book which does not preach Christ can be apostolic, though Peter or Paul were its author. And no Book which does preach Christ can fail to be apostolic though Judas, Ananias, Pilate or Herod were its author’. (I have touched on this elsewhere in the context of a different discussion). As I’ve already intimated, the volume is not without its weaknesses. I know that the term ‘evangelical’ is a difficult one to define (even with Bebbington’s, and other’s, help), but this book could do with a more upfront working definition. The assumption by more than a few of the contributors is that whatever else Barth’s theology is, it’s not really ‘evangelical’. The topics are well chosen, however, inviting helpful discussion in many areas where Barth’s theology rubs some evangelicals up the wrong way. The essays are mostly well written, clear, respectful and informative, and as such contribute a profitable voice to an increasingly symbiotic discussion and critical appreciation of Barth’s work. Who does Madonna want to be like? Just reading this myself at the moment. Found Gary Williams’ reading very interesting. Would love to read his review of Forsyth’s atonement theology.